The purpose of this Sample Question Set is to provide you with information about the EC-Council Certified Ethical Hacker exam. These sample questions will make you very familiar with both the type and the difficulty level of the questions on the 312-50 certification test. To get familiar with real exam environment, we suggest you try our Sample EC-Council CEH Certification Practice Exam. This sample practice exam gives you the feeling of reality and is a clue to the questions asked in the actual EC-Council Certified Ethical Hacker (CEH) certification exam. These sample questions are simple and basic questions that represent likeness to the real EC-Council 312-50 exam questions. To assess your readiness and performance with real time scenario based questions, we suggest you prepare with our Premium EC-Council CEH Certification Practice Exam. When you solve real time scenario based questions practically, you come across many difficulties that give you an opportunity to improve. 01. Which of the following opens the Computer Management MMC in a Windows command line? 02. If a rootkit is discovered on the system, which of the following is the best alternative for recovery? 03. What type of database uses multiple tables linked together in complex relationships? 04. A pen test member is running the Airsnarf tool from a Linux laptop. What is she attempting? 05. In what layer of the OSI reference model is session hijacking carried out? 06. Google Docs and Salesforce CRM are two examples of which cloud computing model? 07. Which type of attack sends fake entries to a DNS server to corrupt the information stored there? 08. In which layer of the OSI model could ARP poisoning occur? 09. Veriato Investigator is an example of what? 10. Cookie Cadger is an example of which of the following? 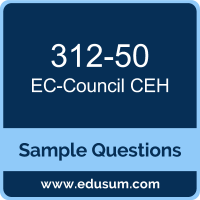 Note: For any error in EC-Council Certified Ethical Hacker (CEH) (312-50) certification exam sample questions, please update us by writing an email on feedback@edusum.com.